Let the baking begin! Today I made the very first recipe for The Bread Baker's Apprentice Challenge, and it happened to be one I haven't made before, Anadama Bread. (You can find the recipe here.) It's a nice airy loaf with a hint of molasses and a surprising bit of texture from the cornmeal. The caption on the photo was added by my husband, who apparently liked it. I think it would make wonderful toast, (will know for sure in the morning), and also a nice sandwich. I made a couple slight variations to the recipe in the book. First, I added a Tablespoon or two of liquid whey to the soaker. This serves the purpose of neutralizing the phytic acid in the corn and unlocking more nutrients. (Phytic acid is an anti-nutrient found in whole grains, nuts, and some beans. It binds nutrients, making them difficult to digest. Soaking the grains in water with a bit of whey, yogurt, buttermilk, etc. makes them much more digestible.) Secondly, I didn't have the "light" molasses called for in the recipe, only blackstrap. I used about half molasses and half honey so the molasses wouldn't overpower the flavor. I'd say it came out just right. Also, I freshly ground dried corn, and the course setting on my grain mill still made it come out more like a fine cornmeal than like the polenta called for in the recipe. I thought it added a very nice little crunch nonetheless. I decided to bake only one of the two loaves tonight, and left the other one, shaped, to proof in the refrigerator for a couple of days. I like experimenting with "time and temperature" and will be interested to see how the bread differs after an extended fermentation. I'll update this post and let you know after I bake it. Update on Second Loaf: I had intended to bake the second loaf on Wednesday, the third day after mixing the dough. However, I didn't get to it until Thursday. I was a little concerned because by Wednesday evening the refrigerated loaf had fully risen and begun to collapse. I took it out Thursday morning, left it out for a few hours, and it rose fairly well. It baked up beautifully, and while I don't think it ever rose quite as high as the first loaf, I think I preferred it. It was a little more sturdy, but not at all dense, and had a more developed and complex flavor. I'm excited about trying new recipes, and my family is excited about eating them. Finally, I thought I'd share a few things I've learned that are helpful in baking excellent bread. If you have a kitchen scale, weighing your ingredients is more accurate than scooping them into measuring cups. All of the recipes in BBA list weights. Use them, if possible. 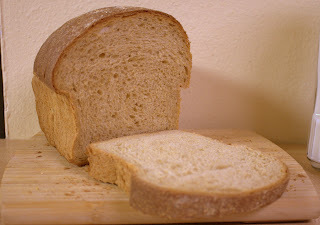 Use filtered water for your bread, as well as for your steam pan and spray. The less "taste" your water has, the better your bread will be. I prefer to use SAF Instant Yeast. You can buy it in a large-ish package at a restaurant supply store and it's much cheaper than buying the little jars or packages at the grocery store. Also, you don't have to pre-soak it in water; you can add it directly to your dough. I usually preheat my oven to 25 degrees hotter than the recipes calls for, than turn it down after putting the bread in; this compensates for the heat lost when opening the oven door, and allows for a more even baking temperature. If a recipe tells you what the internal temperature of the finished loaf should be, use a meat thermometer, instant read if possible. This is a much more accurate test of doneness than time (or thumping.) Set your timer for at least 5 minutes earlier than the cooking time, and check then. Better to give it a few more minutes if it's not done than to overbake it. Thanks for the wonderful tips Rebeca. Your bread looks wonderful! I started my Anadama bread today and will leave both loaves in the refrigerator overnight to develop the flavor. I'm still waiting on my book to arrive! Amazon promised it would be here yesterday. :-( Thank goodness the recipe is on line. Great tips and the bread looks delicious. I'm anxious to start mine, but probably won't get a chance until the weekend. In the mean time, I need to pick up a few things, a food scale being one! Quick question on using a thermometer to check for doneness - do you just stick it into the top center of the loaf? I really like the idea of using my instant read thermometer rather than relying on eye balling it or the thump test. Kelly, I just stick the thermometer into the bread, usually from the side, but in far enough that you're getting the temperature from the center. It will leave a bit of a hole, so if you're making a "pretty" bread, just do it from the side. I did my soaker last night. I used grits cuz the only cornmeal I had was for making tamales and tortilla - lime treated and ground pretty fine. While the grits are still lime treated, I figure they will be more close to the texture the recipe suggest. 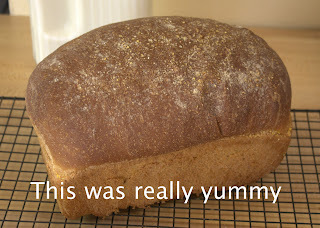 I am going to finish the recipe now, saving one loaf in the fridge for later. I too, like the way flavor develops in a slow rise. BTW, Rebeca, shame on you for not suggesting the whey to me earlier! But you're forgiven; I should have thought of it myself. What a gorgeous, high rise and crusty top! Looks great! I decided to try to make it "5 minute artisan bread" style and it worked - so cool!